OP3257. CARMEN, Live Performance, 31 Jan., 1953, w.Reiner Cond. 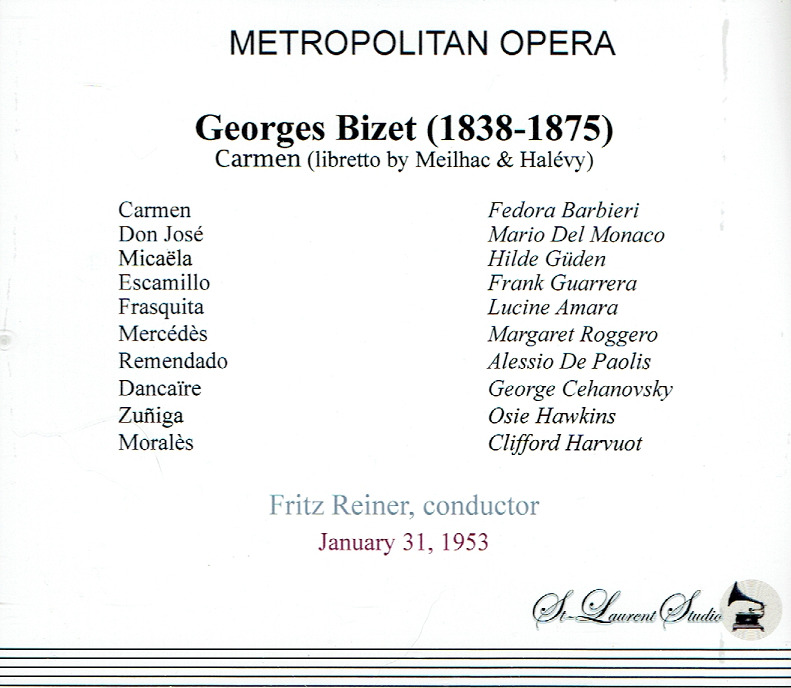 Met Opera Ensemble; Fedora Barbieri, Mario del Monaco, Hilde Güden, Frank Guarrera, Lucine Amara, Margaret Roggero, Alessio De Paolis, etc. (Canada) 2-St Laurent Studio YSL T-705. Transfers by Yves St Laurent. "One Amazon reviewer labelled his review of this performance 'Carmen as Cavalleria Rusticana'. That is not very far off the mark, and surely those who have purist feelings about the French canon might well want to run in the other direction. But for those of us who believe that an international art form can admit different performance styles in order to keep great works alive for a wide range of audiences are likely to find this performance thrilling. St. Laurent Studio has rendered it in sonics far superior to the release on the GOP label. The only truly odd member of this cast is Hilde Guden as Micaela, not because her style isn't idiomatically French (neither is anyone else's), but because her style is not consonant with the rest of the cast. Her Germanic singing just seems out of synch with everyone else, sweet-toned and well sung though it is. Licia Albanese, who was another Met Micaela at the time, would have made a better stylistic fit. In every other respect, one should take this for what it is: a thrilling, Italianate CARMEN with great singing from its two principals (and some smaller roles, too, such as Lucine Amara's Frasquita), adding good, committed singing from its Escamillo. Not incidentally, we also get impassioned, committed, always-engaged orchestral playing under Fritz Reiner, whose quick tempos never seem rushed. 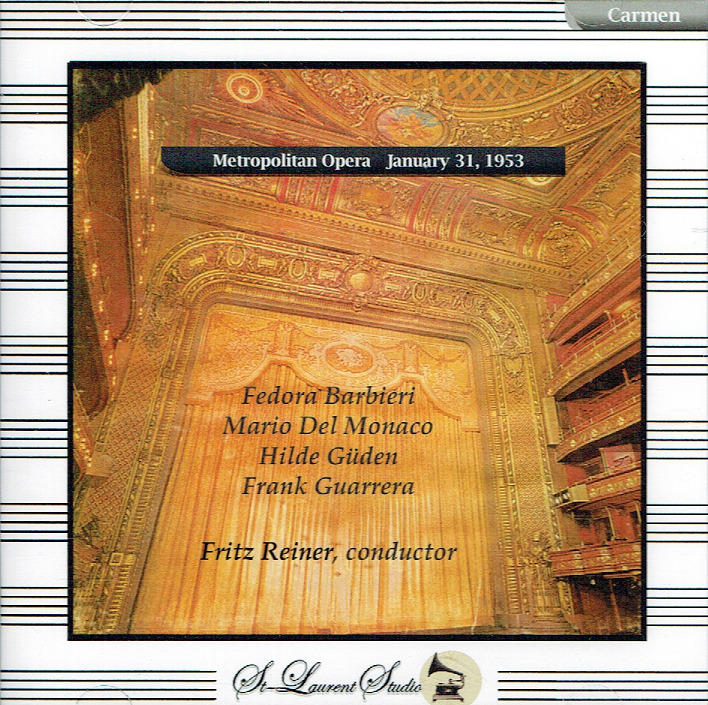 Fedora Barbieri was an important mezzo in the 1950s and 60s, at the Met and on many important recordings. She helped usher in Rudolf Bing's era with a highly successful Eboli in his inaugural DON CARLO production. Barbieri's reputation was made largely in the great Verdi mezzo-soprano roles (Azucena, Amneris, Ulrica). Her approach to Carmen is forceful rather than cultivated, urgent rather than sensual, but it is effective and certainly a viable way to portray the character. There is little subtlety in her seduction of Don Jose, but I am not sure he is a character who would respond to feminine subtlety. From a vocal point of view Barbieri is superb, with an evenly produced, firmly centered mezzo that is free all the way up to the top. If there is a Don Jose who would likely fall for brazen seduction, it is Mario del Monaco. Don't believe the myth that he only sings at levels of forte and louder. He does some very sensitive singing here, including some lovely soft tones in the 'Flower Song' (not the climactic B-flat of course - that is full-voiced and thrilling), and he conveys the heartache of Jose through some effective vocal coloration. Del Monaco and Barbieri create real chemistry, and their scenes together come alive vibrantly. One cannot deny that del Monaco had one of the most viscerally thrilling voices of the twentieth century, and what one remembers from his performance is full-throated, generous singing. Frank Guarrera's Escamillo is not at their level, but he is better than mediocre. He doesn't have the rich vocal equipment of Robert Merrill, a frequent Met Escamillo, and his French seems even more unidiomatic than Barbieri and del Monaco's. But one hears the reason Guarrera had a 28-year career at the Met starting in 1948 and why he was given a total of 680 performances there. He was reliable, a solid singer and a good vocal actor. 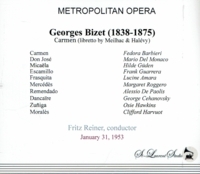 Other Met stalwarts fill out the smaller roles: Margaret Roggero as Mercedes, Alessio De Paolis as Remandado, George Cehanovsky as Dancaire, Osie Hawkins as Zuniga, and Clifford Harvuot as Morales. Every one of those names brings back fond memories to those of us who were regulars in the Met's standing room section or galleries in the 1950s and 60s. They are all at the top of their game here. In sum, this is a thrilling release. As usual, St. Laurent Studio provides no notes, but we do get complete tracking information and documentation of the cast and origin of the broadcast, accompanying a superb transfer. St. Laurent Studio CDs are available at Norbeck, Peters & Ford (www.norpete.com)."